Our website (trackingshipment.net) is not affiliated with MOL. 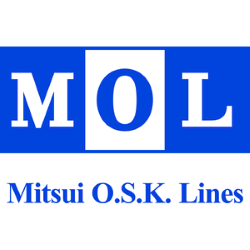 Please be advised that MOL - tracking service has just been added to our service, and we haven't enough time to collect a lot of information about popular questions. At the moment all results are being represented without our correction. You can ask any question about it; we will find an answer to it. We will make a FAQ in the short time. The MOL Tracking Service is an integral part of the working process of MOL Carrier. This company cares for its clients and always ready to provide them with the detailed reports, allowing them to know when their freight is expected to arrive. On this webpage you can easily find out these data, having used our round-the-clock MOL Container track service. The system process data rapidly and gives you only accurate data. This logistics company was founded more than 130 years ago. Taking into consideration its experience, you can hardly find a better spectrum of service in a combination with never-ending spirit of challenge. The company specializes in the international ocean shipping. Its staff comprises approximately 1000 employees. The fleet of the company consists of 830 vessels. All of them are equipped in accordance with the modern standards. The headquarter is based in Tokyo. · To contribute to global economic development, anticipating the requirements of their clients. · Protect the natural environment. · To improve the corporate value through operating efficiency, creativity and promotion of transparent management. Besides, the MOL Container Tracking service simplifies the process of collaboration with the customers. This ocean shipping company has a broad range of services that meet the needs of modern times. The company’s fleet comprises many types of vessels, ranging from specialized dry bulkers for coal or wood chips to tankers, able to ship crude oil. Besides, there are plenty of car carriers to ship ready products. This peculiarity allows them to perform on time delivery of all types of goods. For those who are greatly concerned over the delivery process, can defer to the service of MOL Shipment tracking. You will hardly find better service than MOL tracking to find out the precise location of your parcels. · Dry Bulkers (to ship coal, grain or iron ore). · Tankers (to transport crude oil, liquefied chemical products, etc). · Car Carriers (to transport all types of vehicles). · Containerships (a broad selection of containers to transport all types of cargo). · Cruise Ship. The company owns a cruise ship, offering everyone interested to enjoy an amazing sea voyage. It makes no matter what type of services you wish to make use of. In any case, you have an exceptional opportunity to use the MOL Carrier tracking service. It lets you see the delivery process in the online mode. The MOL Express Tracking service is available to all customers of this company on this website and on k2track. To track and trace your delivery item, you should know the tracking number. Knowing this code, you can easily get the information about the locality of your parcels. Just enter it in the field above and see where your freight is at the moment.